Dominical is a town on the beach, situated on the South Pacific Coast, very close from Quepos, Manuel Antonio, the Marino Ballena National Park and San Isidro de General. Dominical is a 4 km strip beach surrounded by palm trees and exuberant vegetation, with year-round consistent waves that can reach over 10 feet high that attract visitors from all around the world. The town began as a small fishing village but has since grown into a tourist destination most notably for surfers. There is a paved highway connecting it to San Jose and to San Isidro de General. Dominical is now home to a thriving and friendly community and offers natural beauty, some restaurants, hotels for all budgets, a wealth of activities and local amenities. 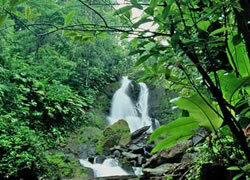 Dominical is very popular for its large waves all year-round. Swimming here is very dangerous because of strong swells and rip tides. But visitors can kayak off the coast or enjoy some diving and snorkeling opportunities in the area, rain forest hikes and camping, horseback riding to the Nauyaca or the Pozo Azul Waterfalls, and wildlife observation in the nearby National Park Marino Ballena. This park is home of a wide variety of fauna like turtles and whales that come here occasionally to mate and nest. Dominical is very close to many towns and attractions such as Jaco beach, Manuel Antonio National Park and Manuel Antonio National Park. Visitors can also take a short day trip to the lovely Ca�o Island just off the coast. This island is considered one of the best adventure diving and snorkeling spots in Costa Rica, and includes beautiful and diverse marine life.